U.S. Marine Corps Gen. Joseph F. Dunford Jr., chairman of the Joint Chiefs of Staff, talks with U.S. service members after a USO show at Bagram Airfield, Afghanistan, Dec. 8, 2015. Dunford was traveling along with entertainers from the 2015 USO Holiday Tour to visit deployed service members. Retired Army Gen. George W. Casey Jr., the chairman of the USO Board of Governors and former Army chief of staff, estimated that the USO has served more than 35 million Americans over its history. The USO marked its 75th anniversary Feb. 4 at a gala in Washington, D.C. Medal of Honor recipients, USO volunteers, active duty personnel, veterans, members of Congress, and stars of stage, screen and music gathered to mark a milestone for an organization founded as America geared up for World War II. The USO came into being during a dark time in history. The United States was not at war, but the rest of the world seemed to be. Hitler’s troops stood on the English Channel and launched nightly air raids against London. In the Pacific, Japan eyed the colonial possessions of France and the Netherlands – two of the countries Germany had conquered in its 1940 blitzkrieg. In face of such threats, the United States instituted a military draft, calling hundreds of thousands of men to the colors, and Americans wanted to reach out to their young men. President Franklin D. Roosevelt asked charitable organizations to band together to provide morale and recreation services to service members. 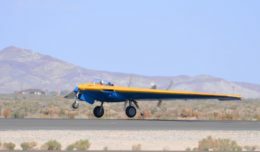 Six civilian organizations answered the call: the Salvation Army, the Young Men’s Christian Association, the Young Women’s Christian Association, the National Catholic Community Service, the National Travelers Air Association and the National Jewish Welfare Board. These organizations chartered the USO in New York on Feb. 4, 1941. Japan attacked the United States on Dec. 7, 1941, and America entered the war. The Army, Navy and Marine Corps grew, with more than 12 million men and women in uniform by 1945. And the USO grew as well; by the war’s end, about 1.5 million Americans had volunteered for the USO. Actor-comedian Bob Hope – a man who would be virtually synonymous with the organization — held the first camp show in 1941, and for the next five decades, he was the face of the organization. The organization changed just as the American military changed, and it is continuing to change. And wherever the military went, the USO went, too. There were USO centers in Korea, Vietnam, Bosnia, Somalia, Kuwait, Iraq and Afghanistan. The USO also has centers at most major airports that provide a place for service members and their families to gather their wits as they travel, and the organization also helps service members as they transition out of the military. The USO has grown to the extent that today, just a small portion of its budget goes to entertainment. But that aspect is still there. 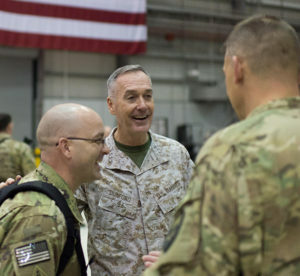 Marine Corps Gen. Joseph F. Dunford Jr., the chairman of the Joint Chiefs of Staff, led the annual USO Holiday Trip to Naval Air Station Sigonella, Italy; Camp Lemmonier, Djibouti; Naval Support Activity Manama, Bahrain; Bagram Airfield, Afghanistan; and Ramstein Air Base, Germany, in December. He told the crowd at the anniversary celebration that the trip opened his eyes on what the organization provides the men and women of the U.S. armed forces. But it is even more than that, the general said, and it goes to the heart of why the USO is important to America and its fighting forces. The country has asked a lot from its military since the attacks of 9/11, he noted, and the troops have performed magnificently. “I think it’s exceeded any of our expectations, and there’s a lot of reasons for that,” he said. One of the reasons the young men and women who have deployed forward have performed so well, the chairman added, is that they “have gone forward knowing that they had the support of the American people.